Tezzeret here has a lot of game text, but to be fair, it’s all pretty relevant. With enough artifacts in play, he can basically one-shot people with his +2 – and it even scales in multiplayer. His -3 is entirely unrestricted as to the artifact’s characteristics, making Wurmcoil Engine and Mindslaver even more ridiculous than usual. And his ultimate may not be as fast or reliable as cheating something into play with the usual suspects we’re familiar with from Legacy and Vintage, but it’s definitely abusable in its own right. Note how well it interacts with any effect that might be looking for more than one thing coming into play at once, or the likes of Panharmonicon from Kaladesh. Of course, the thing you were probably looking at is his static ability, and it’s striking enough that you might get stuck there and barely read the rest. And yes, a six-mana card that just gave your creatures and planeswalkers affinity for artifacts and nothing else might still be playable. Between Treasure tokens, Thopter tokens, and guild locket-style things, you could probably put together something that takes advantage of it in Standard – much less formats where Darksteel Citadel is played. 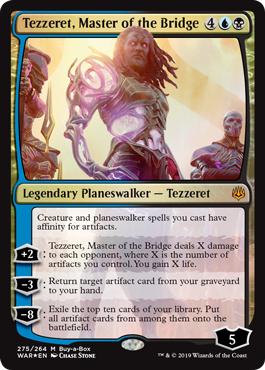 Tezzeret, Master of the Bridge is the Buy-A-Box Promo, so he’s not getting a limited score. Well, this is interesting. Tezzeret, Master of the Bridge brings back one of the most infamous keyword mechanics of allllllllll tiiiiiiiiime, affinity for artifacts, roughly 15 years after it destroyed Standard. As a quick reminder, affinity for artifacts makes spells with it cost 1 generic mana less for each artifact you control. We’re some distance away from Kaladesh, the last artifact-heavy block, but treasure has become a Thing in recent sets (with Ixalan offering a lot of it). As a one-off without affinity himself, Tezzeret is a bit weird. His +2 seems to hearken back to his Agent of Bolas incarnation, where you zap your opponents based on your artifact count, and his -3 fishes back an artifact. His ult is actually really powerful if you build around it, and it pops fairly quickly after he resolves (especially with the help of proliferate)…and synergizes with his passive. Tezzeret is a weird card to try and pin down; we’re not presently in a Standard that has a lot of artifacts, so his strength is reined in somewhat, and his high mana cost makes him a daunting inclusion in deeper card pools. That said, affinity has a feared reputation for a reason, and something tells me Tezzeret might be a playable threat in, oddly enough, Legacy and Vintage. These formats have a surfeit of artifacts and fast mana, and Tezzeret serves as both accelerant and finisher.